What steps are involved in a test and how long does it take? A test may last up to two and a half hours, with the actual time one is ‘hooked up’ to the equipment only a small part of the entire process. Initially we conduct a thorough pre-test interview allows us to discuss the issues with the examinee and prepare them for the testing. This comprises an explanation of the equipment and how the test works, discussion of the issue and the questions that will be asked of them. It is very important to define proper questions to which the examinee is certain they are being truthful on, to avoid anything unrelated to the issue interfering because of a poorly worded question. We then conduct a practice test unrelated to the real test. That gives a person a chance to get used to wearing the equipment, because it can feel a bit intrusive, at first. It also gives us chance to set the equipment up for that person. 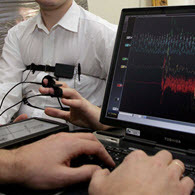 The polygraph is collecting physiological data created by the involuntary part of the central nervous system, to establish if there is a response, when the examinee is asked the relevant questions. These responses have been proven to be associated with deception. The majority of a test is the preparing the examinee for the test, setting the equipment up for them and ensuring they understand the scope and meaning of all the questions and are following all the instructions given to them by the examiner. Nerves do not affect the test, since everyone has some apprehension when taking a test. Anxiety is not part of the details collected, and is observed and registered before the actual testing is conducted. The actual test is then conducted a number of times, before the results are then determined. Contact us to see how we can help you, today.